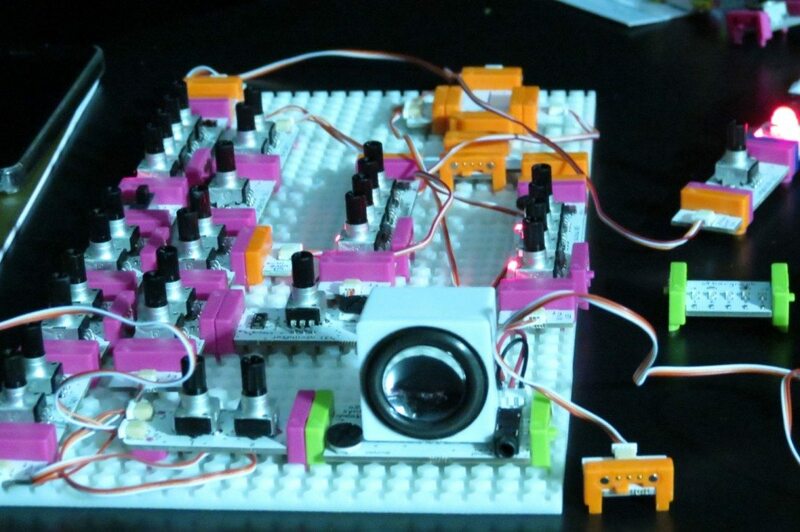 The thump and rhythm of music creation will soon be within reach for users of littleBits. At last Friday’s press preview for the Engadget Expand tech show, littleBits CEO Ayah Bdeir made a whole lot of noise. Actually, it was more like well-controlled electronic wave tones and dope beats. After her time on stage, Bdeir showed me the soon-to-be-released Synth kit, developed in partnership with electronic musical instruments maker Korg. This new set of modules brings a layer of sound to littleBits, Bdeir said. Inside the kit, folks will find oscillators, a little speaker, and other simple components to create tones and melodies. “You can combine [this] with any other Bits in the library,” she said. That includes generating lights in rhythm with sounds from the Synth kit. Not quite like having a homemade dubstep music machine, but it is start. If that sounds interesting, you’re in luck—folks who grab tickets now for Xconomy’s Hardtech Revolution forum on Dec. 9 can get the best price to hear more about Bdeir’s plans to make technology more accessible. She’s just one of the stars coming together at our latest event, which looks at how hardware, real-life marketplaces, and other “offline” businesses are being transformed by the latest innovations in technology. And now her plans extend into the audio world with the forthcoming Synth kit. Using the new modules—and Bits from other kits—users can create a synthesizer, add a light sensor as well as pressure controls to trigger sounds with the touch of a finger. There is also a sequencer for programming different beats. Music, Bdeir said, is teeming with technology from devices to apps. She said she wants to keep it simple though so the masses can make music for themselves. The Synth kit is expected to ship in early December. Bdeir, an MIT grad, formed littleBits to encourage others to start inventing. Her company is backed by True Ventures, PCH International, Khosla Ventures, Lerer Ventures, O’Reilly Alpha Tech, and individual investors such as Joanne Wilson and Joi Ito. Bits are not just good for piecing together novel circuits, Bdeir said. They can be combined with other materials to let people create prototypes and gadgets. Anyone, from kids to engineers, can use the modules, she said, and even add logic gates and timing functions.